There’s a hidden jewel in our magnificent atrium lobby and it’s called Terrace Café. Intimate yet airy, and elegantly casual, Terrace Café serves consistently pleasing meals any time of the day. Surrounded by the garden-like interior plantings that enhance the entrance of the hotel, diners enjoy a prime view of the hustle and bustle without being in the middle of the fray. Savor a traditional breakfast of eggs and bacon, pancakes, French toast and other classic favorites. Lunch and dinner include oversized salads, sandwiches, fish, pastas and contemporary American bistro style entrees that are sure to satisfy even the most discerning palates. And for those who’ve played late into the evening, Terrace Café is the place to kick back with a post-party midnight snack. 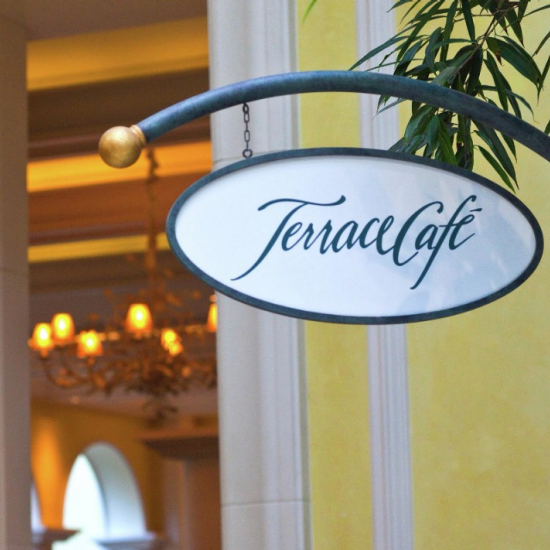 Click here to download a PDF of the Terrace Café Menu. Walk east from the hotel front desk past the resort front doors. The walkway into Terrace Café will be straight ahead. Exit from the parking garage elevators and take a right through the glass doors onto The Shopping Promenade. Continue on The Promenade to the Hotel Lobby. Continue straight past the hotel desk on the left and the resort front doors. The walkway into Terrace Café will be straight ahead and slightly to the left. Yes, all casinos have buffets. But not this buffet. Forget the tired old image and experience a line-up of creations that rivals the best restaurants on the Coast.